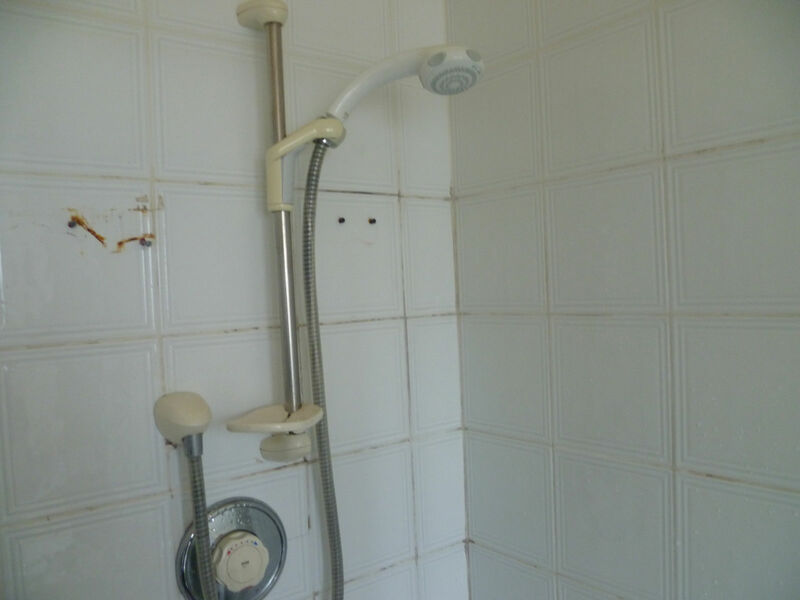 Our clients contacted us in despair with their bathroom. The request was to renovate their ceramic tiled bathroom at a house in Oxford, a beautiful location, as most will know the city is known worldwide as the home of the University of Oxford, which is in fact the oldest university in the English-speaking world, also known as the “city of dreaming spires”. They had tried many supermarket solutions to clean up the grout and sort out the silicone trim, to no avail. 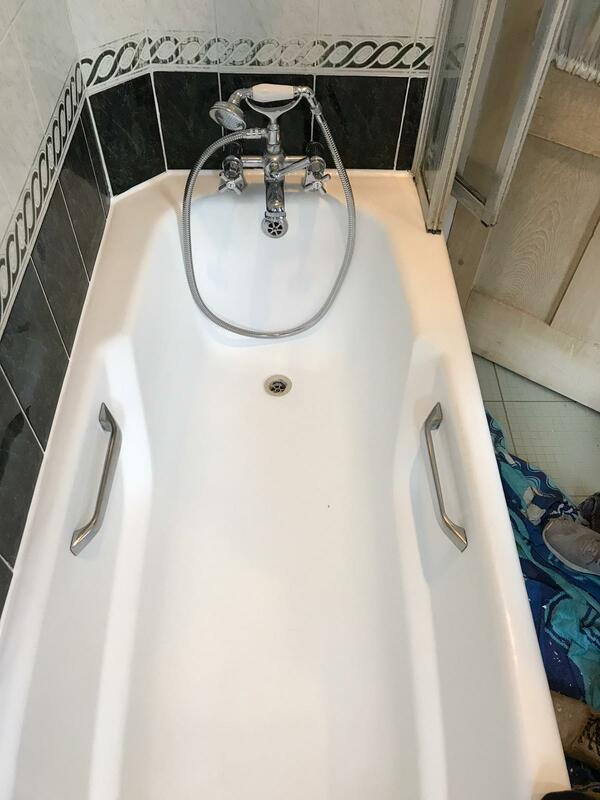 The ceramic tiles were in good condition so the specific focus for the client was on treating the dirty grout and silicone trim around the bath. 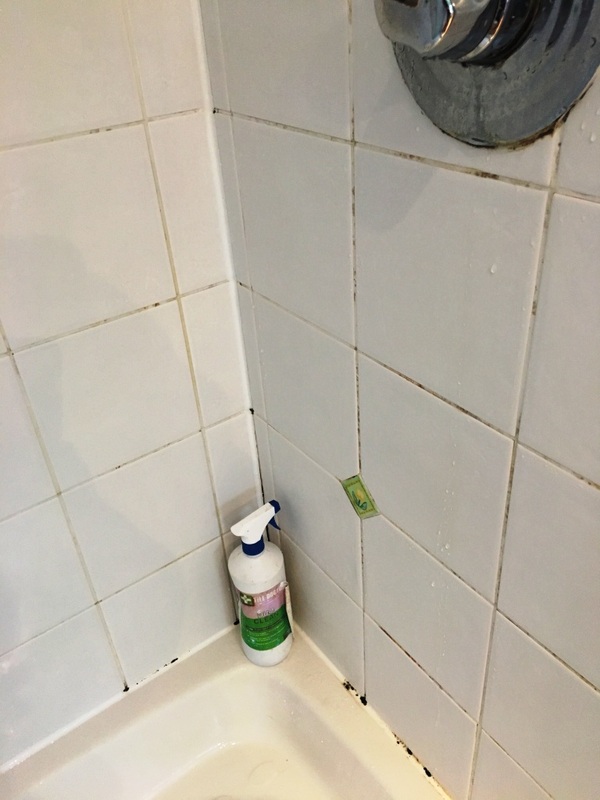 The grout has gone black with mould in some places and this is a very common problem in UK bathrooms where it thrives in the warm damp conditions and is usually related to a lack of ventilation. The simple action of leaving a window and door ajar after having a shower helps to cross ventilate and can reduce the problem. Of course, this is not always desirable during cold weather so improved mechanical extraction is always better. Another option is to run the shower cold for a few minutes afterwards, in fact some modern showers have this feature built in for that purpose. I discussed the causes with the client, we agreed a quote and arranged a day to complete the work. I started by spraying the grout with Tile Doctor Duo-Clean, this is a fast and effective double action grout cleaner and mould remover. It cleans up grout and can remove mould and blackspot from grout and silicone and is suitable for use on plastic and enamel baths and showers. I left this to soak in for about 30 minutes, and then worked in sections spraying more Duo-Clean and scrubbing with a grout brush and rinsing each section with water. After cleaning the whole bathroom, I left it for an hour so that the grout had dried. I could then see if there were any places needing a second clean, in this case there were a few stubborn areas and so the process was repeated. Once I was satisfied I had fully cleaned the grout and tiles I took a break and left the bathroom so that the grout would completely dry out. At this stage the tile and grout were already looking much better. For aftercare we recommend the regular application of Tile Doctor Oxy-Pro, this is a powerful alkaline product especially formulated for cleaning shower Tile and Grout. It’s a highly effective cleaner that removes soap scum, body oil, mildew and algae from areas that have been neglected or subjected to frequent use. This will keep on top of the problem and ensure the bathroom continues to look nice and clean. The client was very happy with the result which was completed in one day. The bathroom was certainly left looking very fresh, clean and much more appealing. The photographs on this page were taken at a property in St. Albans, Hertfordshire or Verulamium as it was known in Roman times. St. Albans is roughly 20 miles north-west of central London and a popular choice for commuters who work in London. 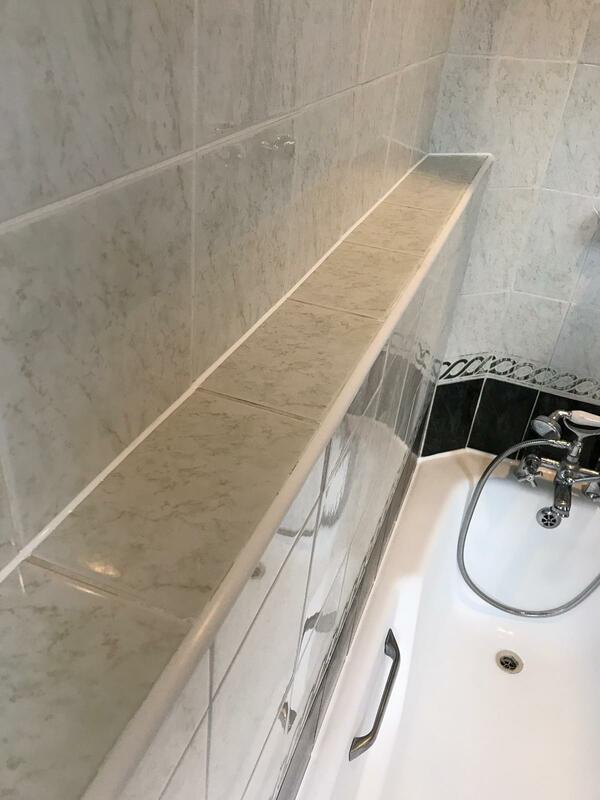 The owners were fed up with the discoloured grouting and their bathroom looking tired and had tried lots of products on the market to get the grout looking clean. The results had been disappointing, and they were starting to despair. 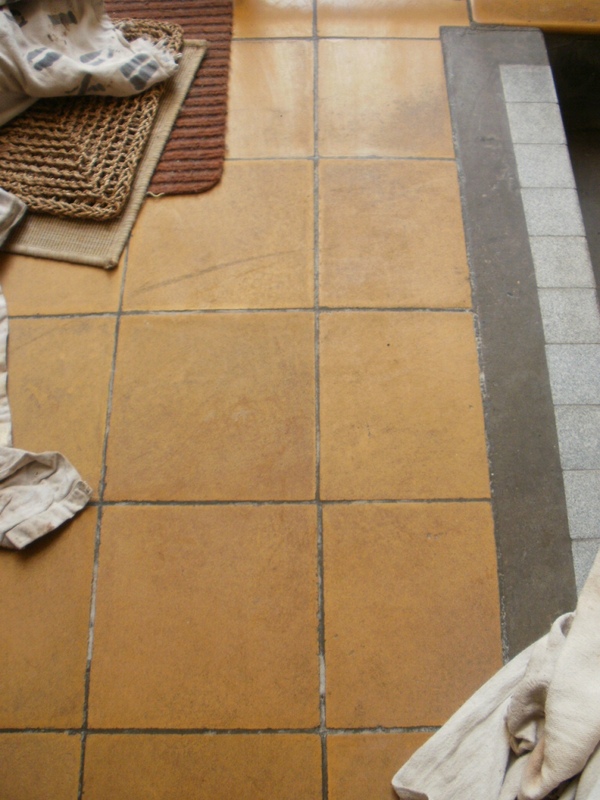 They contacted me to see if I could help and after visiting the property I recommended deep cleaning the Ceramic tile and grout and then removing and re-grouting those areas that were badly stained. I explained that this would take one day to complete and by using a series of products we would soon have the bathroom looking more pleasing. Happy with the quote which was far less expensive than installing a new bathroom I scheduled the work in for an agreed date. We started out by preparing the area with protective sheets and tape to threshold edges. This was then followed by giving the tile and especially the grout a deep clean using Tile Doctor Oxy-Gel and aa steam cleaner to get the grout as clean as possible. Oxy-Gel is a strong alkaline gel cleaner and degreaser which works well on vertical surfaces where a long dwell time is required. Being a gel, it stays in place allowing it to really get to work on the dirt making it an ideal choice for this situation. The top layer of grout is porous and, as a result, it easily absorbs grease, dirt and limescale. Grout between wall-tiles, particularly in damp areas like bathrooms, will become dirty and unattractive and if the ventilation is inadequate Mould and Mildew can develop. The grout was scrubbed with Oxy-Gel several times to get it as clean as possible and then rinsed off with water. Next, using a craft blade we carefully removed all the old silicone sealant, so it could be replaced later. This was followed by re-grouting using a white grout to match the existing. Whilst the grout was drying the final step was to replace the silicone sealant around the bath edge with fresh sealant. We always use high quality mould resistant silicone for this as we don’t want any call backs later when the sealant goes mouldy or water leaks through. After making some final checks and ensuing excess grout was polished off the tiles the bathroom transformation was complete. Even I was amazed at how much cleaner and tidier the bathroom now looked. The important thing was the customer who was equally impressed and left the following comment on our Tile Doctor feedback system. Ceramic tiles don’t have the charm of natural stone, but they are very easy to keep clean; grout on the other hand has a porous top layer that can become stained. This was the problem with a customer of mine who lives in the small rural village of Childs Ercall in the North of Shropshire. 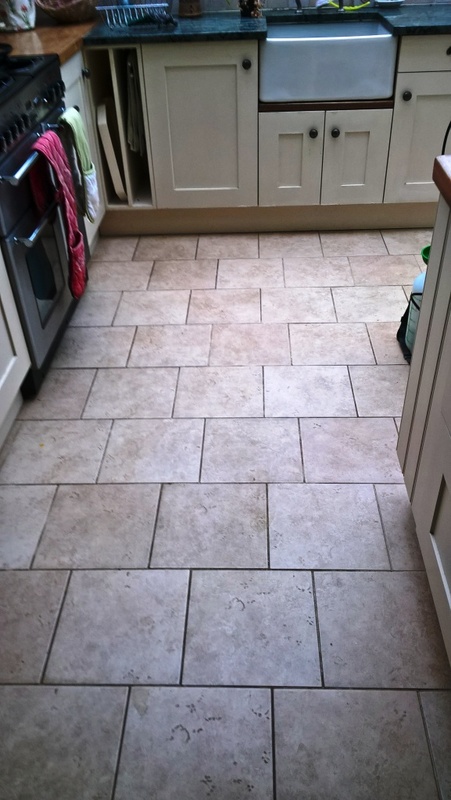 The customer had moved in about two years ago and they said that they can keep the floor clean and their main problem was the grout. 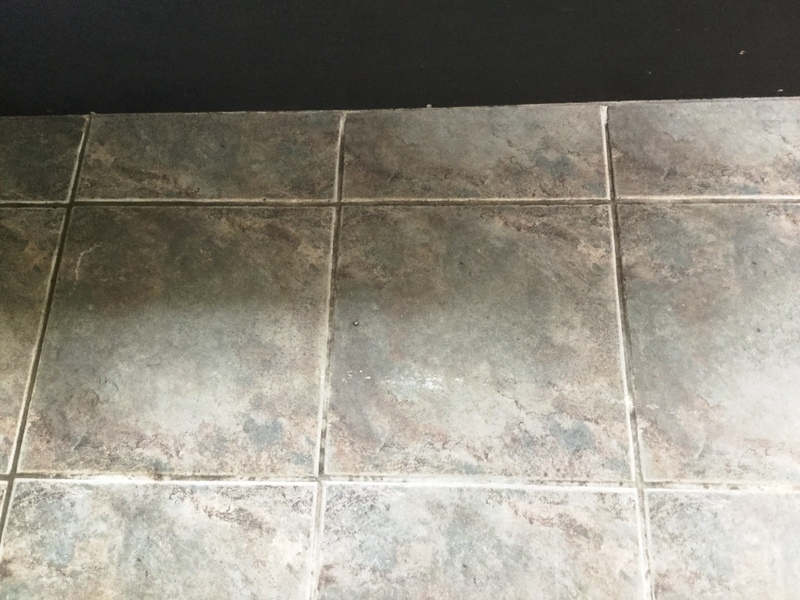 I went to take a look at the problem and gave the grout in one section a good scrub with Tile Doctor Pro-Clean which is a strong alkaline tile and grout cleaning product. The result was good and although the grout returned to its original colour they wanted it to be changed. 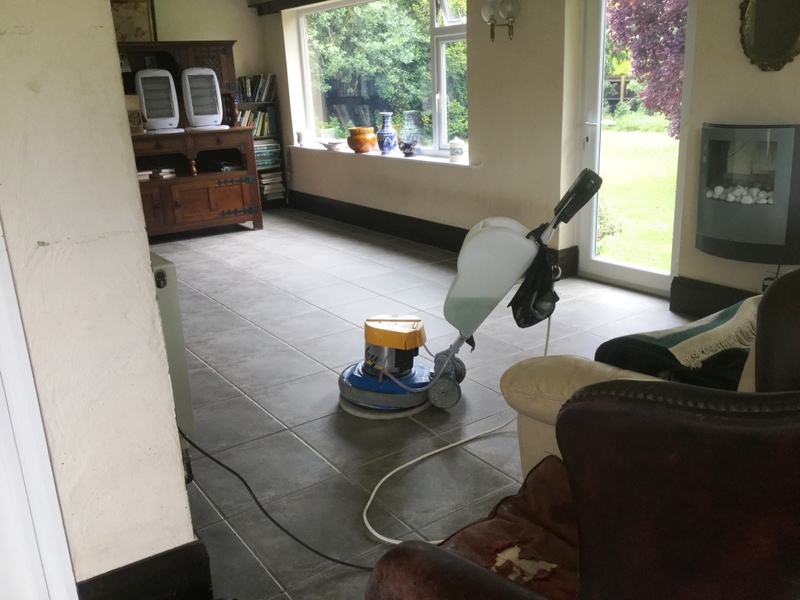 Before colouring the grout, it made sense to give the Ceramic tile and grout a thorough clean by scrubbing in a weak dilution of Tile Doctor Pro-Clean with a floor buffer fitted with a scrubbing pad running at slow speed. Once done I rinsed the floor with water and extracted the slurry with a wet vacuum. With any grit and dirt removed from the floor the next step was to prepare the grout for the colourant. Tile Doctor have an acidic pre-treater cleaner for this which cleans and microscopically etches the grout giving the colourant a superior bond with the colourant. The solution is applied to the grout and then scrubbed in with a stiff brush before being rinsed off with water as before. 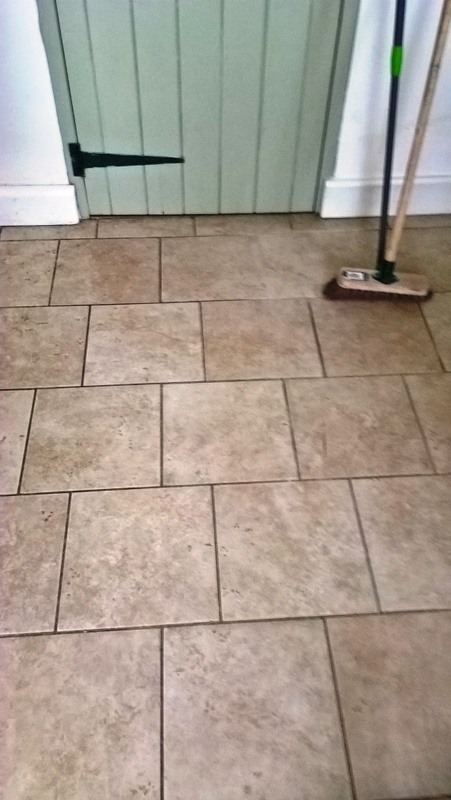 I have to agree with the customer, changing the grout colour was a good move and I think you will agree the floor now looks much improved. 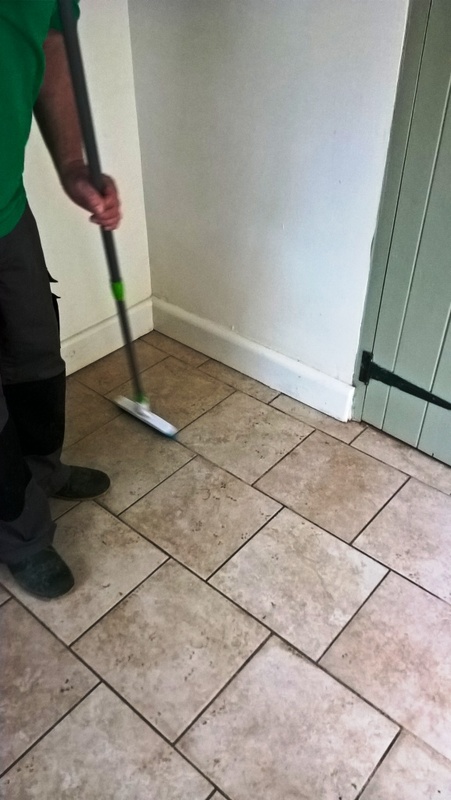 The grout colourant has the additional advantage of providing a barrier over the grout which will protect it from further issues and make it as easy to clean as the ceramic tiles. 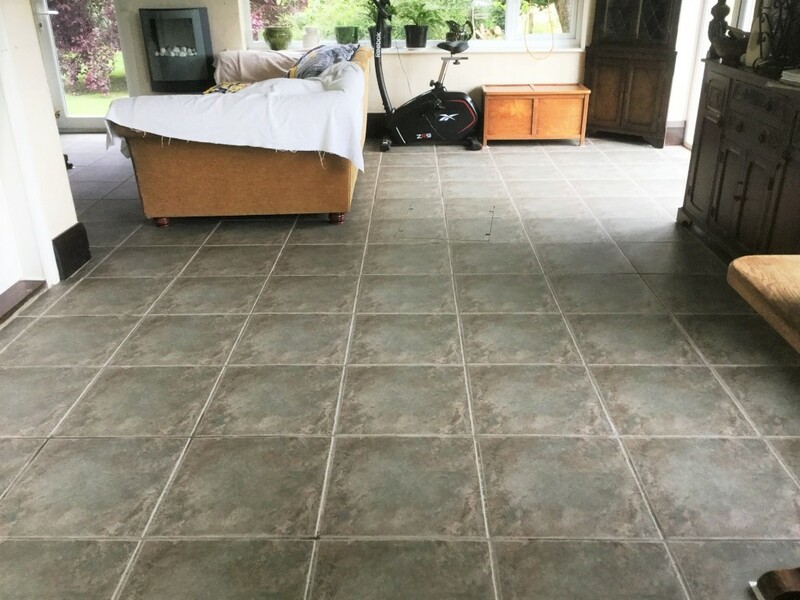 A customer from Rushden which is a large town in the east side of Northamptonshire, and my home town asked me to take a look at the Ceramic tile and grout in his Sun room. He has a large dog that sleeps on the sofa in this room and over the years the dog has walked in mud which has slowly degraded the grout lines and I suspect had probably never been sealed correctly or sealed at all. The glazing on Ceramic tile is very resilient so we usually find it’s the grout discolouring that becomes most noticeable first due to the cementitious top layer which can trap dirt. In this case the Ceramic tiles had dulled over the years and as you might expect the white grout lines had become soiled and were almost black in places. To get the tile and grout clean the floor was first soaked in a strong dilution of Tile Doctor Pro-Clean and this was left to dwell for ten minutes. A rotary machine fitted with a black scrubbing pad was then used to scrub the cleaning solution into the tile and release the dirt. The pad can struggle to reach the recessed grout so to ensure this was also clean it was given a good scrub with a narrow stiff brush. We then used a spinning tool which forces hot water under high pressure onto the floor whilst simultaneously extracting the dirty water with a powerful vacuum. The objective of this action is to power wash the floor whilst rinsing and extracting the dirty cleaning solution at the same time. 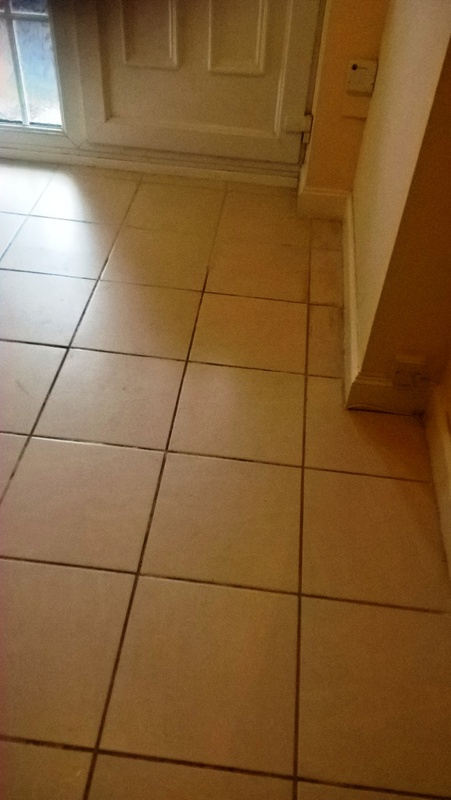 We inspected the grout lines and stubborn stains were treated with Tile Doctor Grout Clean-Up which was scrubbed in with hand brushes, this was then rinsed a second time until we were happy with the results. Grout Clean-Up is an acidic product that is particularly good at removing grout smears which can form a haze over a tile reducing its brilliance. We then polished the floor with a white buffing pad and allowed the floor to dry overnight before returning the following day to apply Tile Doctor Ultra-Seal to all grout lines. The furniture was too large and heavy for the customer to move out of the room, which was on a lower level than the rest of the ground floor. As a result, it was necessary to clean the floor in sections moving the furniture around the room on pads as needed. 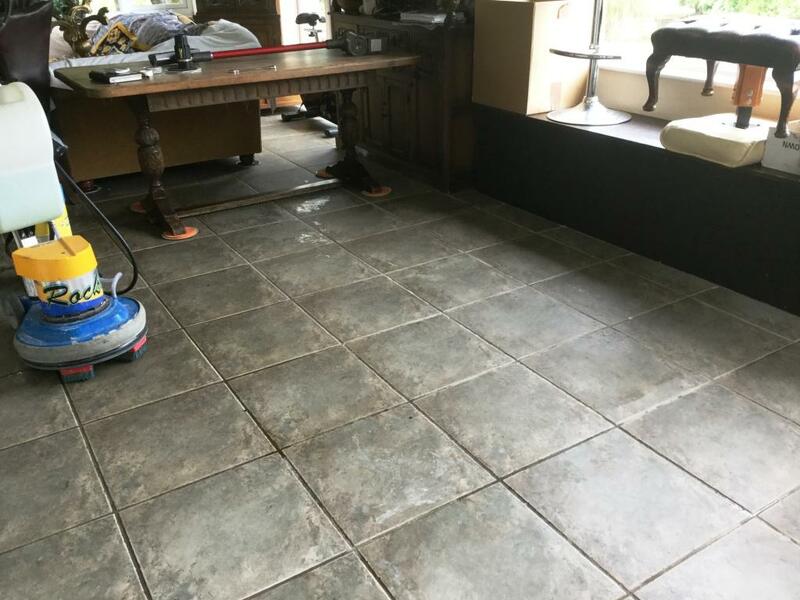 The Sun room floor look great afterwards, the grout especially looked clean and the sealer should ensure it stays that way for some time to come. When renting property out a property it makes a lot of sense to give it a quick facelift to ensure it’s more attractive to future tenants, not only will it rent faster but it should also command a better price. 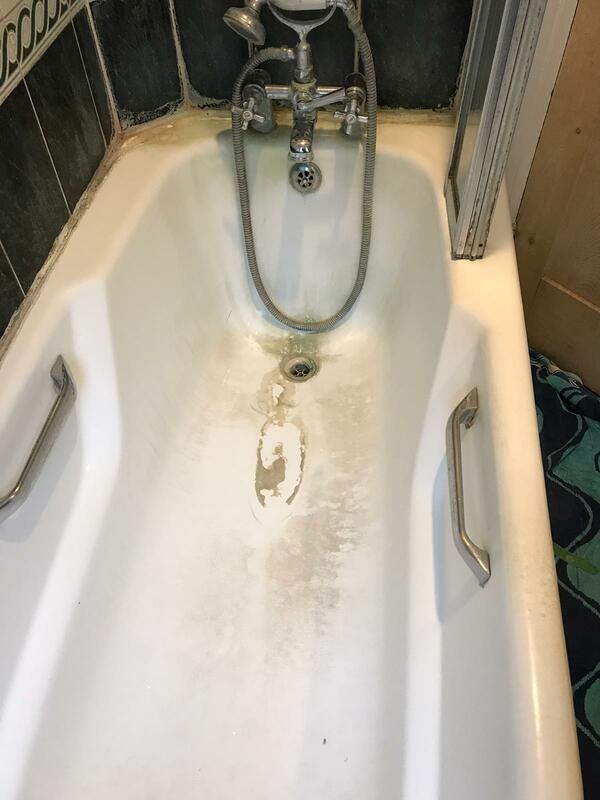 Many landlords don’t realise this but giving bathrooms, a facelift is the one thing you can do quite cheaply and quickly that can rapidly improve the appearance and desirability of a house, after all no-one wants to rent a place with grotty tiles! 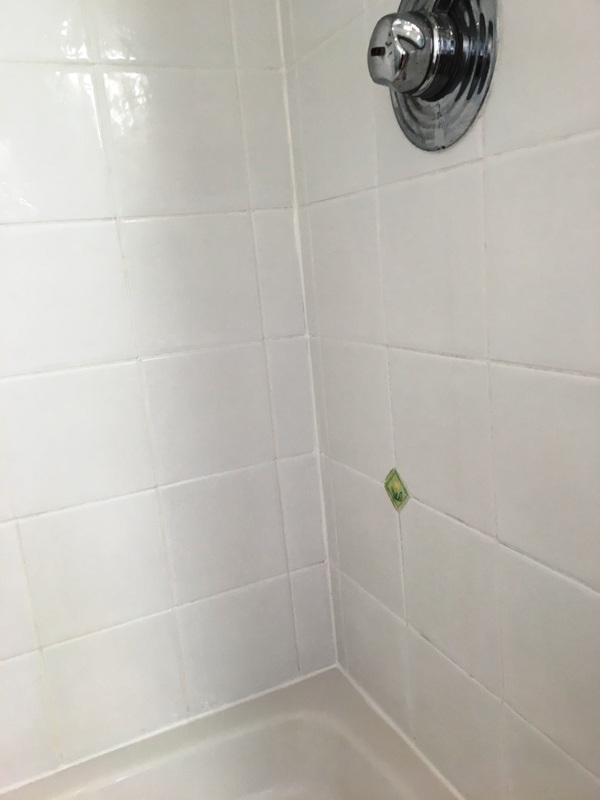 A returning customer of mine recently contacted me about restoring the condition of a Ceramic tiled shower cubicle in a flat she owned in the Surrey village of Oxshott. She was about to rent the property out to a couple of international students, and so wanted it looking its best in all aspects. You may be wondering why international students would want to live in Oxshott but it’s not too far at all from the University of Surrey. The town of Oxshott is quite large and has a low population density. There are many private roads in the village – and it has been named the “most expensive village in England” and so a very desirable location. 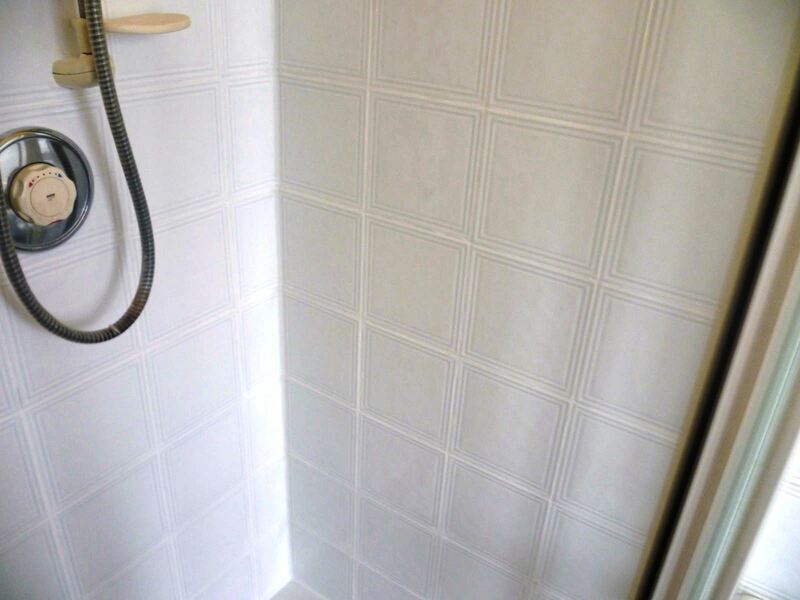 We tend to follow a tried and tested method that we have developed at Tile Doctor for restoring shower cubicles. 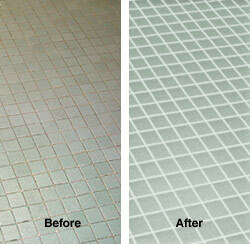 To begin, I cleaned the grout lines using our acidic cleaning product, Tile Doctor Clean-Up. The product was scrubbed into shower wall tile and grout using a handheld rotary machine fitted with a six-inch black scrubbing pad. Being a concentrated phosphoric acid cleaner, Grout Clean-Up effectively removes mineral deposits (salts etc) and grout smears from the tile surface to leaving it looking much fresher, it also prepares the grout for a superior bond with the grout colourant that was to be added later. Following this, I scrubbed the tiles down with Tile Doctor Pro-Clean to provide a general clean and to remove any other muck and dirt. This was followed by a rinse with water to remove any trace of cleaning product from the tile and grout. The next step was to remove all the existing silicone mastic with a sharp knife; the mastic sealant stained with mould and much in need of replacement. Once all the rubbish was swept out, I dried any remaining dampness from the grout and tiles with a heat gun. This left the grout ready to be recoloured. I did this over the course of a few hours, using a White colourant from the Tile Doctor Grout Colourant range. White is just one of ten colours available in the range and was chosen in this case to give the grout a really fresh look and to blend in with the White Ceramic tiles. The application of Grout Colourant not only colours the grout joints – it also seals and rejuvenates them. It also dries quickly, so I could apply a second coat quite soon after the first, removing any excess as I went. Once the restoration was finished, I resealed the shower base with fresh silicone mastic again in White to match the tile and grout. As a courtesy, I also cleaned the shower glass too, leaving an excellent result overall – and one very happy customer! Cirencester is a large market town in the East of Gloucestershire known for its rich history dating back to the Roman times, when it was known as Corinium. This area is also home to the Royal Agricultural University, the oldest agricultural college in the English-speaking world. 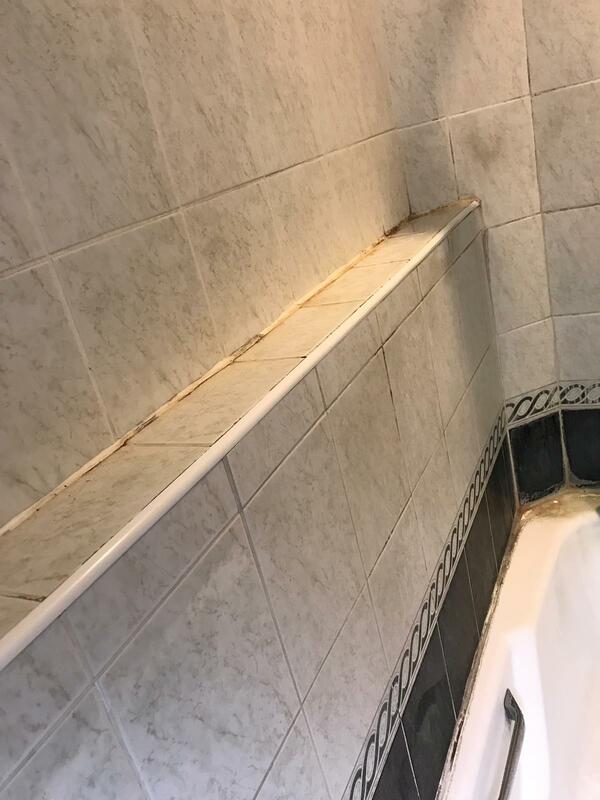 I visited the town recently to see a customer who was having significant problems with the cleaning of her Ceramic tiled hallway. Ceramic tiles are always a popular choice in high traffic areas like Hallways and Kitchens due to their durability, as well as water and scratch resistance. However, this floor had been installed a decade ago and during that time had not received adequate maintenance. Although the Ceramic tiles themselves had not faired too badly the grout lines were heavily ingrained with dirt, making them near impossible to clean with everyday cleaning products. The property owner had tried numerous products without success and determined to get the grout clean again sought assistance from her local Tile Doctor. I deal with these types of issues all the time so I was happy to pop round and see what could be done to restore the floor back to its peak condition. To begin, I set about cleaning the grout lines using a mixture of Tile Doctor Remove and Go, which is a multi-purpose stripper and degreaser that breaks down any old sealer, and Tile Doctor Pro-Clean, which is a strong alkaline-based cleaner suitable for all types of stone and tile. I applied the cleaning solution and left it to dwell for about 30 minutes, before using a grout brush to lift away a decade’s worth of grime and muck. Next, I used Pro Clean again to scrub the tiles in combination with a black scrubbing pad fitted to a rotary machine, before rinsing the entire floor with fresh water to remove any traces of chemicals. Then, I dried the grout lines with a heat gun and left them to cool for about 10 minutes. The grout lines were subsequently ready to be sealed. With the floor ready to be sealed, I applied Tile Doctor Ultra-Seal to the grout lines using a pipette, which is a tool used to deliver a measured quantity of sealer. Ultra-Seal is a premium sealer which is formulated to provide maximum stain protection. While leaving the grout with a natural look, the sealer will keep the grout looking fresh and free of ingrained dirt for some time to come. The customer was amazed at how quickly I could transform the condition of the grout. 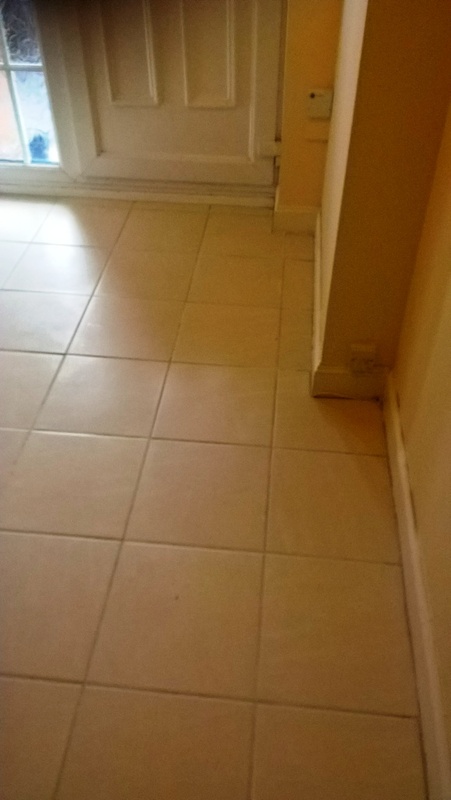 As you can see from the photo below, the condition of the grout really shapes the appearance of the floor – and now these Ceramic tiles are a real asset to the property once again. 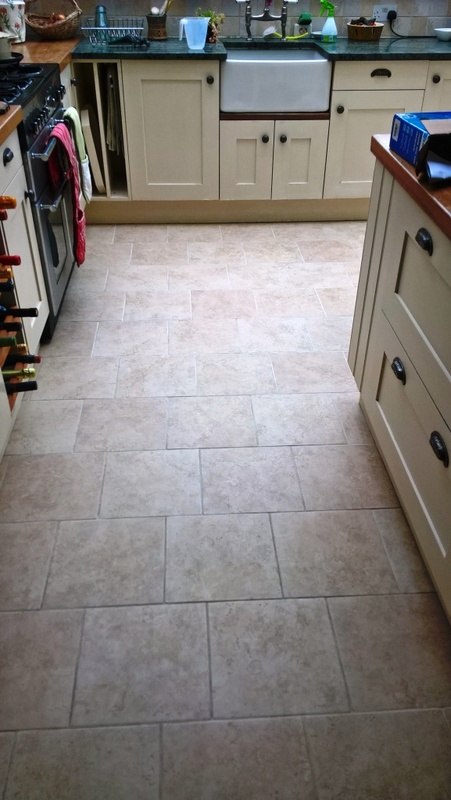 This customer who lives in the old picturesque village of Westmancote, Gloucestershire asked me to do a home survey on their ceramic kitchen tiles which had been laid around fifteen years prior. With the exception of general cleaning not much had work had been done to the tile and grout and now the tiles were looking dull and the grout had turned black. 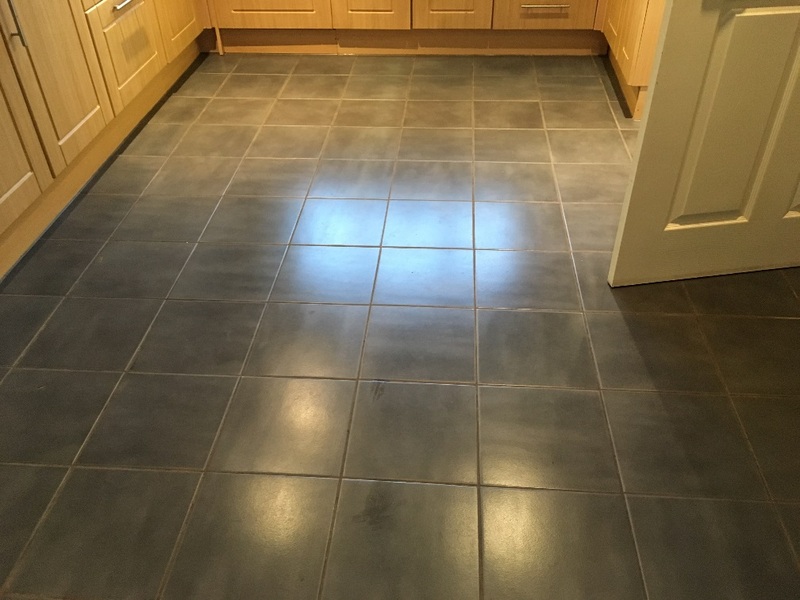 As part of the survey I ran a test clean on part of the floor and the tile and grout came up really well which convinced the customer to give me the job and I was soon booked in to return to complete the floor and work my magic. The first job was to give the floor a sweep to remove any grit and then I set about cleaning the grout lines. The grout had trapped a lot of dirt so I decided to start with the application of Tile Doctor Remove and Go which is a strong cleaner/stripper that is safe to use on all types of tile and grout. The Remove and Go was left to soak into the grout for about ten minutes before being scrubbed in with a stiff grout brush. This process released the dirt and the now soiled solution was rinsed away using water which was then extracted using a wet vacuum. Next step was to turn my attention to the Ceramic tiles which needed a deep clean so this time I applied a medium dilution of Tile Doctor Pro-Clean, left to dwell for ten minutes then ran over the tiles with tan pad fitted to a rotary buffing machine. Once the floor was done I rinsed away the soiled cleaning solution with water and extracted with the wet vacuum. 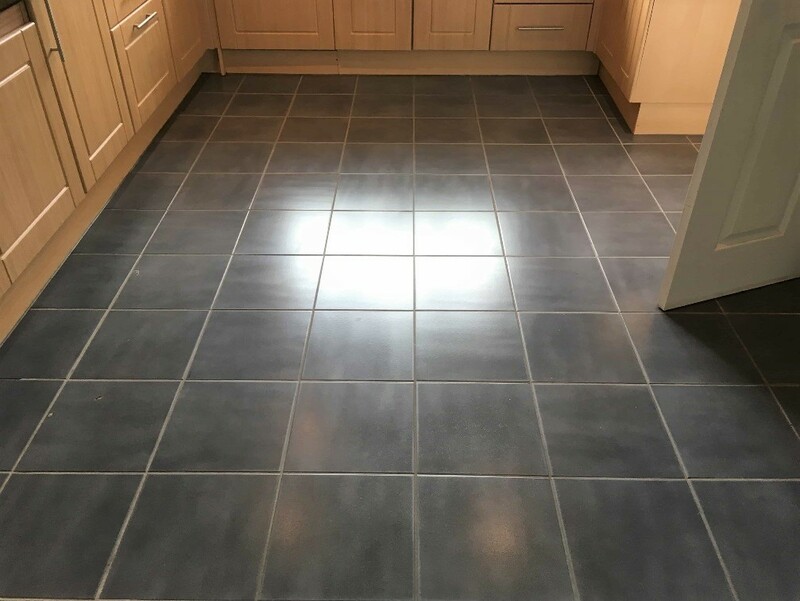 I find it’s always the grout that lets down the appearance of a Ceramic tiled floor which are usually fairly maintenance free, to guard against this I always recommend the grout is sealed. Given the condition of the grout in this case it was definitely a good idea as I’m sure it wouldn’t be long before it started to discolour again. With this in mind I sped up the drying of the grout lines with a heat gun and once done I sealed the grout lines using Tile Doctor Ultra Seal applied carefully with a Pipette. The customer was pleased with the end result and left the following feedback via the Tile Doctor feedback system. Very professional work. We were sold on it when he came to quote and did a small patch clean. Malcolm was able to come within a few days of confirming his price was acceptable and the job was done swiftly and to an excellent standard. We now have a new floor! As well as bathrooms and kitchens we also cover swimming pools which usually have a tiled pool surround and this was certainly the case with the photograph below which was taken at a property near the small market town of Sandy in Bedfordshire where the tile and grout around the pool had discoloured over time. To clean the tiles we used a strong dilution of Tile Doctor Pro-Clean which left to soak into the tile and grout in sections before being scrubbed in using a stiff brush. You have to be careful with machinery around swimming poos as you don’t want any cleaning products draining into the swimming pool water. The pro-clean and scrubbing action loosened the dirt and we were then able to use a Rotovac machine to finish the floor off and get the results you see above. The Rotovac which is also known as a Spinner tool is a really useful piece of equipment for a Tile Cleaner as it directs a jet of high pressure hot water onto the tile whilst simultaneously removing the water through a separate suction feature. The tool needs a lot of power so it runs from a high-pressure cleaning and extractor unit fitted into our van which can delivery water pressure between 500 and 3000 PSI. Another feature of the tool is the side skirts around the spinner head which along with the high suction prevent water from being splashed around making it ideal for this job. 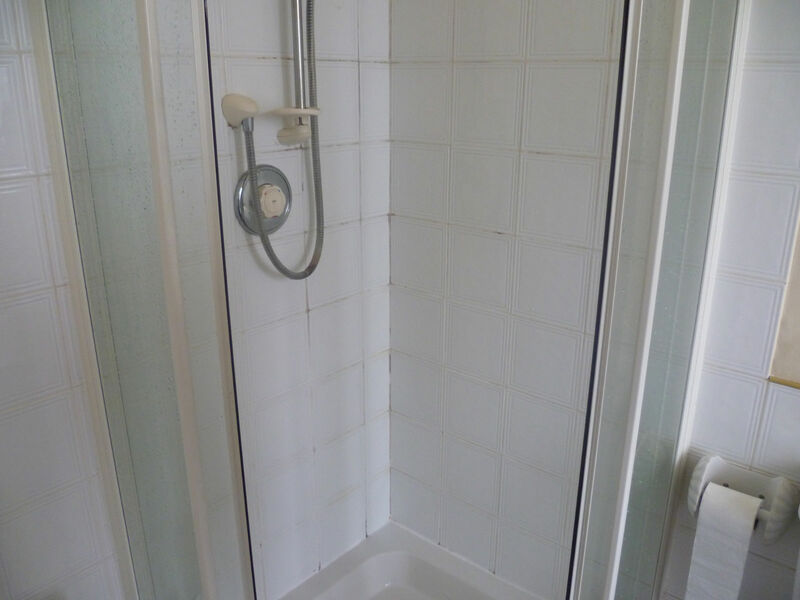 This shower cubicle was installed in the main bathroom of a house in Bishopton where the grout had become quite grubby and the Ceramic tiles were looking quite dull. 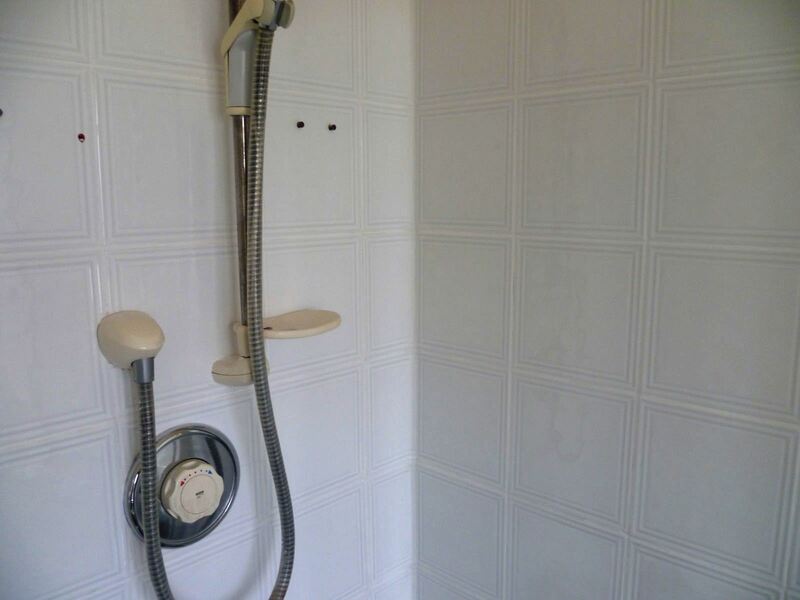 The owner was thinking about re-tiling the bathroom and thought they would give us a call first to see if we could refresh the look without the expense. We started by spraying the tiles with Tile Doctor Oxy-Pro which is a strong high-alkaline cleaner especially formulated and packaged for cleaning showers. The spray delivery is important as mixing the cleaning product with air makes it lighter and helps it cling to the tile and grout. The Oxy-Pro was left to soak into the tiles for around 15 minutes before being scrubbed into the tile and grout using a stiff grout brush. This action cleaned up the grout and tile nicely removing stains from shampoos and soaps etc. The grout was looking much improved but there was however some evidence of mould remaining which needed dealing with. To tackle this we used Tile Doctor Mould Away which is designed to remove mould off Silicone and Grout. It’s very easy to use, you simply spray the Silicone or Grout to be treated with Mould Away then leave to soak in for five minutes and then scrub with a brush and rinse with water repeating the process until the mould has disappeared. It took a fair amount of manual effort but the results were well worth it as you can see. 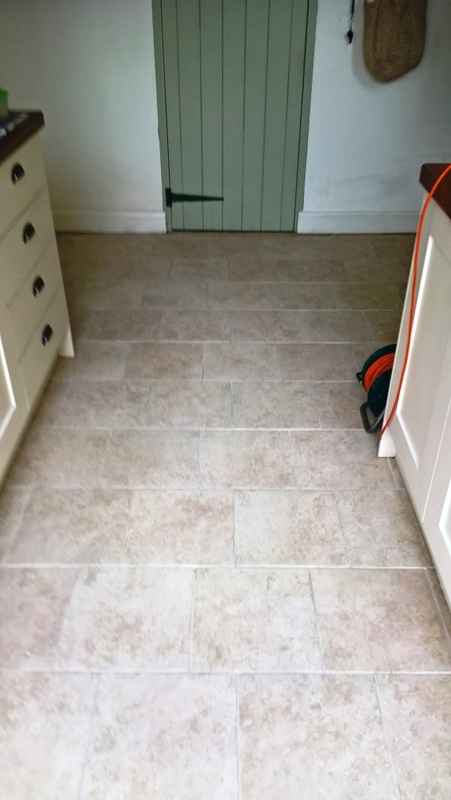 This fifty year old Ceramic tiled floor was installed in the communal parts of a small block of flats in Poole, Dorset. 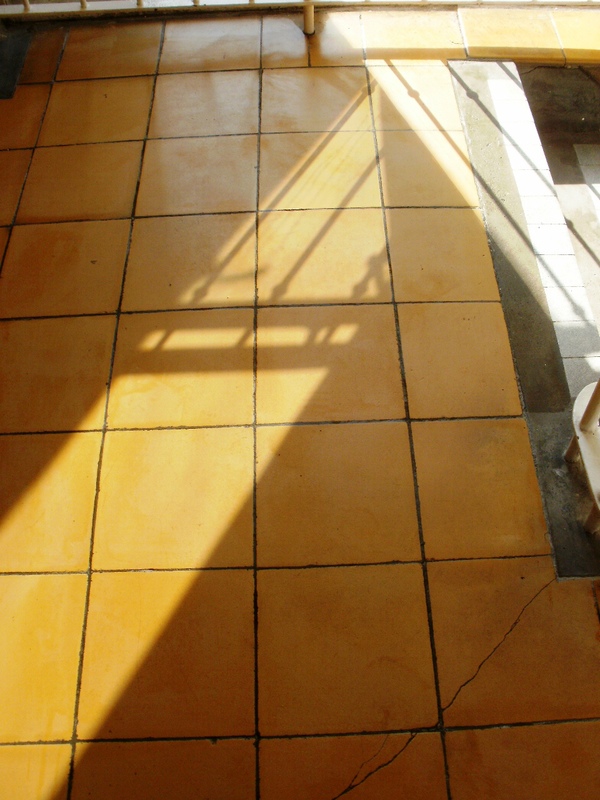 The tiles had not been given a deep clean in a long while and were now ingrained with dirt from many years of wear. To clean the tiles a strong dilution of Tile Doctor Pro-Clean was applied a left to soak into the tile for some time before working it into the floor using a rotary machine fitted with a black scrubbing pad. During this process it became clear that there was evidence that the tiles had been previously sealed using a metallised emulsion. This needed to be completely removed by buffing the floor and then steaming it; steaming also removed a myriad of paint spots that had accumulated over the years. 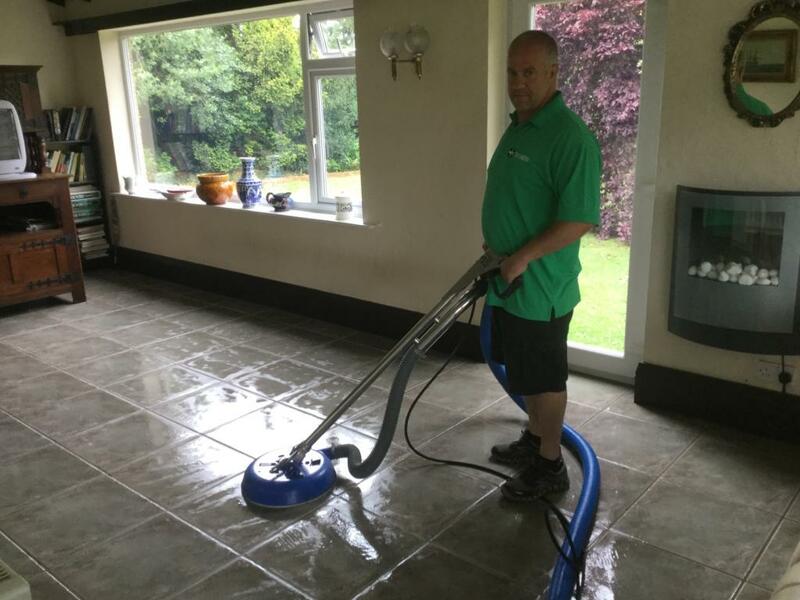 At this stage we took the opportunity to give the grout a good scrub with more Pro-Clean and a stiff hand brush before removing the cleaning solution with a wet vacuum and giving the entire floor a thorough rinse to remove and trace of cleaning product. The tiles were left to dry off overnight and we came back the next day to see if further work was needed. Now normally Ceramic tiles have a glazed surface that a sealer cannot take to however these tiles being were very old and the glaze had been worn off so sealed a small test are to see if it would take. The test was successful so I proceeded to seal the whole floor using Tile Doctor Colour Grow. Due to the age of the tiles some were more faded than others which I could do nothing about however they looked generally clean and bright after restoration and the new Colour Grow sealer should provide protection for years to come.